613-15 E. Meinecke was called the “worst” house in Riverwest with an assessed value of $23,100 in 2001. 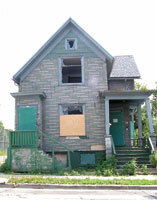 Since then it has been rehabbed (pictured below), and in 2004 it is assessed at $85,800. In the past year, Riverwest property values increased faster than any other neighborhood in Milwaukee, leaving many residents surprised and concerned. In Milwaukee, residential property values increased by almost 10 percent overall. The average increase in Riverwest was around 24 percent, while in some pockets of Riverwest, average property values almost doubled. The City Assessor’s office divides Riverwest into six “neighborhoods” for assessment purposes. The neighborhood bounded by Locust Street on the north, the river on the south, Pierce Street on the east, and Holton on the west showed the largest increase — from an average of $49,696 last year to $96,091 this year, a 93 percent increase. Other assessment neighborhoods showed smaller, but still significant increases — anywhere from 10 to 39 percent. The average price for a single-family unit in Riverwest went up 18 percent; two-family units increased in value by 23 percent. 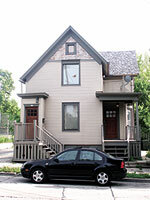 613-15 E. Meinecke in 2004 after being purchased and rehabbed by Timothy Brophy. Taxes were $1,122.69 in 2003 and will be about twice that in 2004. Assessed values were $23,100 in 2001; $31,200 in 2002; $41,900 in 2003; and $85,800 in 2004. Gentrification refers to the process of displacement that occurs as property values rise in a neighborhood, generally resulting in people with lower incomes moving out of the neighborhood as people with higher incomes move in. It could be argued that Riverwest has been gentrifying slowly for years, unlike some areas of the country where rapid gentrification has resulted in dramatic demographic changes almost overnight. But recent housing assessment jumps worry some residents. While Riverwesters in general consider themselves welcoming of diverse and new people, they are concerned that the jumps in home values will affect the things they value — diversity and affordability — about their neighborhood. 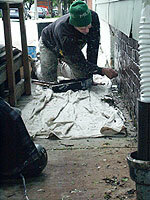 David Lundgren, a painter for Old Friends Painting Co. adds a fresh coat of paint to U.P.R.O.C. (Urban Patrons Reclaiming Our Community) on the corner of Center and Bremen Streets. “The part that really bothers me is that they’re kind of stepping on the backs of the hard work the people had put into the community,” Smart said. “It’s pretty defeating to try to work in your park, to try to make the neighborhood a better place, only to be told you can get the hell out.” She added that she knows several families who have had to move to the inner city because of the lack of affordable, decent housing in Riverwest. Judy Swanson is also concerned. Her house, on the 3400 block of Weil Street, increased in value by 10 percent this year. “We paid over $3,000 in property taxes last year,” she said. “We’re still looking at paying an increase in taxes. It’s frustrating.” Swanson added that, although Riverwest continues to attract new homeowners, many residents are still concerned about crime. “We’ve had people who’ve been held at gunpoint. We’ve had bikes stolen from backyards,” she pointed out.